Welcome to some weekend fun and entertainment with drones. We spend a lot of time scouring the web for news, information and more on all the great drones around the globe. In our travels, we encounter some fun and funny stuff, and we want to start sharing that with you. Today we will be taking a look drones and sausages. Next up in our series, let’s explore some fun with drones and food, more specifically drones and sausages. 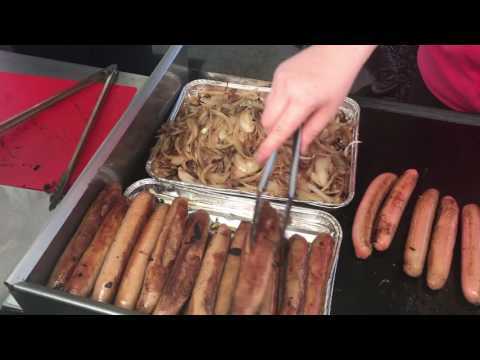 This video comes to us from Australia and shows off one of the things we are most proud of, Bunning’s sausages. In this video, you can see a guy flying a drone to his local Bunning’s hardware store to get himself a sausage. Not only did this video hit the mainstream media the owner was also slapped with a fine of $900. We do not recommend doing this as its illegal and can land you in big trouble. Unlike the last video this one is from a Russian YouTuber who doesn’t seem to like sausages as much as the Australians. This video combines three types of sausages and a racing drone. We will let you see how that goes.